Niguel Summit West is the 15th most walkable neighborhood in Laguna Niguel with 734 residents. Niguel Summit West does not have many bike lanes. Nearby neighborhoods: Niguel Summit, Crown Valley Highlands, Monarch Summit, El Niguel Heights, Niguel Ridge, Crest de Ville and Niguel Ranch. 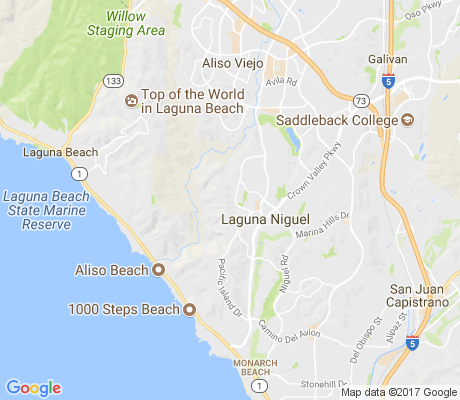 Almost all errands require a car in Niguel Summit West Laguna Niguel. Niguel Summit West is the 15th most walkable neighborhood in Laguna Niguel with a Walk Score of 21. Find apartments in Laguna Niguel's most walkable neighborhoods: Country Village, Rolling Hills and Rancho Niguel. Compare Niguel Summit West to other Laguna Niguel neighborhoods. There are about 0 restaurants, bars and coffee shops in Niguel Summit West. People in Niguel Summit West can walk to an average of 0.0 restaurants, bars and coffee shops in 5 minutes.